I remember it when it was the Sugar loaf many many years ago, no one ever drank in it, what a dump that was. This pub was an O'Neills, but it has just gone through a name change, facelift inside and out, much brighter inside, now called Philomena's Irish bar and sports cafe, same staff , same owner, same craic, I enjoy my nights in this pub. This used to be the Sugar Loaf and featured in an episode of Minder. It was a decent London boozer. It's now a grim sports bar. To be avoided like the plague. Has changed effective September 21st to Philomena's. It remains M&B with the faux-Oirish makeover of the last decade(s) being stripped away, and the bar somewhat cavernous being lightened and opened up. A full renovation is slated for April 2013 and a third handpull likely. Having featured one real ale for the last few years, demand and a shift in the market has now led to two. Currently on is Sharp's Doom Bar, likely to be a permanent feature, and Harveys Sussex Bitter, and both a good 3/5 yesterday. Big screens remain, and sports will feature at weekends. A dark and gloomy pub illuminated by the glow of large screen tvs everywhere you look with just about every football and rugby match of the weekend advertised. It seems to be a rugby hotbead as the largest screens were all marked up for the Tri Nations/World Cup warm up games, so football fans beware. 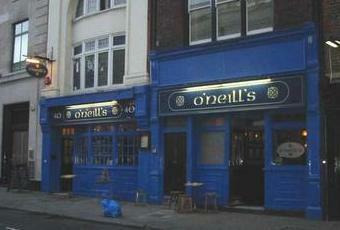 Beer wise it's the usual O'Neill's keg rubbish (yawn). Lovely pint of Trevor McDonals in here. Staff are very quick to serve, which is always a plus when your trying to neck 4 in an hour!!! Well worth a visit for a pint or 2 if in the area.